The original Merle Fogg Field. Fort Lauderdale Daily News December 1945. Operations at FLL didn't grow along with Broward County's population. 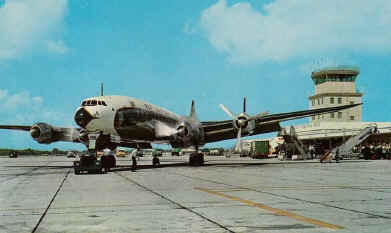 Low-cost traffic propelled the airport's growth in the 1990s, with Southwest opening its base in 1996, Spirit in 1999, and JetBlue in 2001. Spirit made FLL a hub in 2002 and in 2003 JetBlue made FLL a focus city. During the 2005 hurricane season FLL was affected by Hurricane Katrina and Hurricane Wilma. Katrina struck as a Category 1 and caused minor damage, however the airport was closed for about a 48 hour period. However, when Hurricane Wilma made landfall in October roof damage was reported along with broken windows, damaged jetways, and destroyed canopies. The airport was closed for a period of 5 days. Hurricane Wilma was a Category 2 when its center passed to the west of FLL. Beginning February 2007 the airport started fees to all users, including private aircraft. It is one of a handful of airports to administer fees to private pilots. A minimum charge of $10 is assessed to private aircraft which land at the airport.